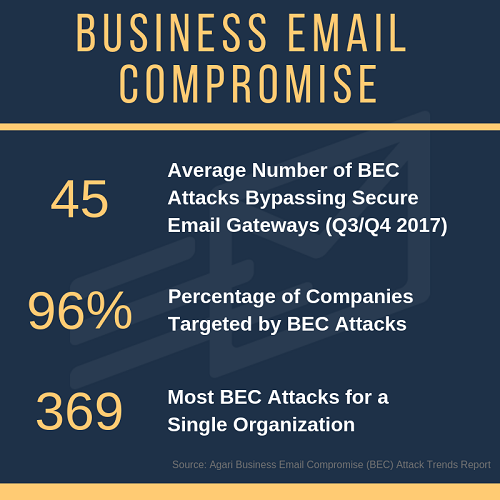 In part one of our three-part series on Business Email Compromise (BEC), I explained what a BEC attack is and provided examples and statistics. 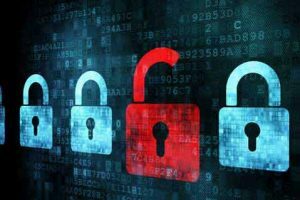 As you’ll recall from the examples discussed, businesses have suffered staggering losses to these attacks, and while users are becoming more aware of them, their own human nature dictates that these threats will continue. 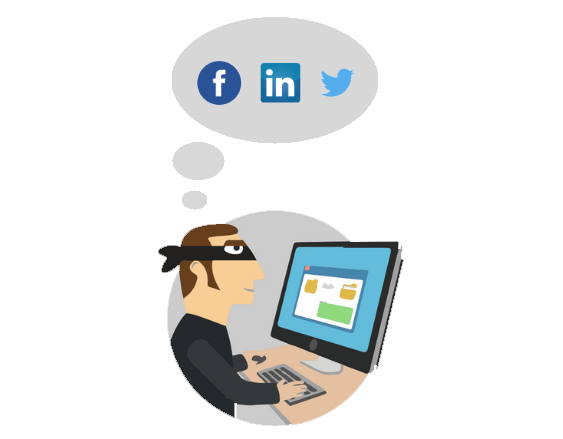 In fact, a recent report by Get Safe Online indicated that over a third (37%) of employees don’t know what to look for to identify common email scams. The report also stated that one in 20 email fraud victims were so ashamed that they hid their mistakes from their colleagues. In part two, I discussed the following 4 steps cybercriminals take to conduct a BEC attack. 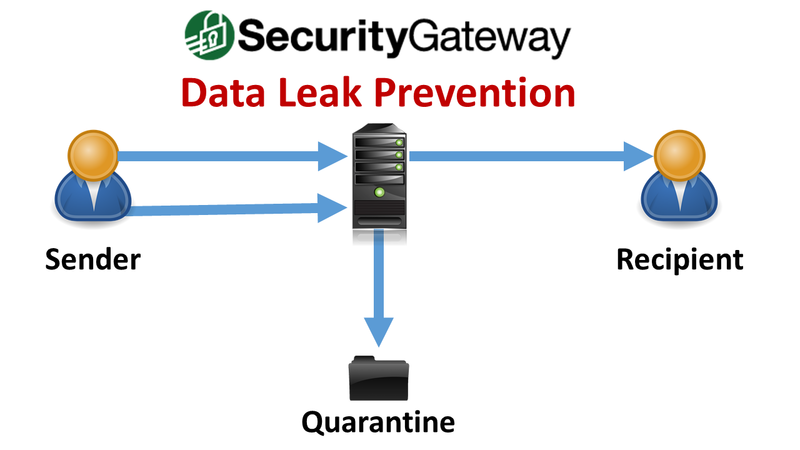 Businesses can make Step 1 more difficult by carefully crafting and monitoring online content such as company websites, LinkedIn profiles and other publicly available information, but as long as employees can be influenced by excessive trust, intimidation, or simply lack of awareness, businesses will need to implement additional preventive measures to avoid potentially devastating losses. After all, once a credible target has been identified, the best defense is a well-informed workforce. Domain Name Spoofing – Domain name spoofing involves either spoofing the sender’s “Mail From” to match the recipient’s domain in the message envelope, or using a legitimate domain in the “Mail From” value but using a spoofed “Reply-To” domain in the message header. A quick examination of the message headers reveals a return-path address that is not associated with the From address. A reply to this message would go to frank.thomas@example.com. Display Name Spoofing – Most BEC attacks use this technique. 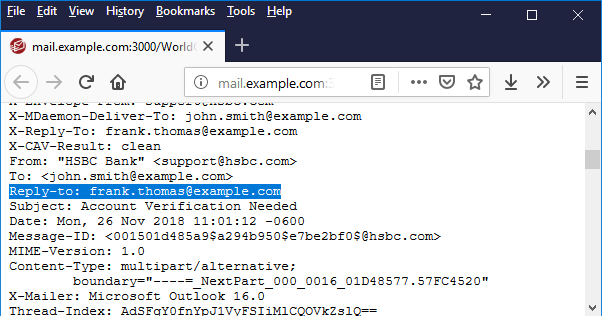 With display name spoofing, the attacker will register a free email account that may contain the name of a company executive. 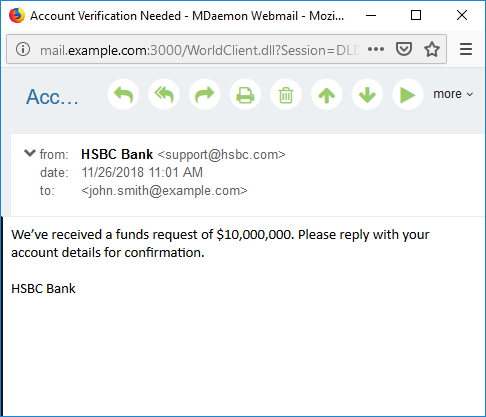 The attacker would then configure the display name to match your CEO or some other executive, and then send phishing messages from this account. This technique works because recipients often only look at the display name and not the actual email address. In fact, many email clients (particularly on mobile devices) will only show the display name when viewing the message, making it easier to hide the sender’s real identity. Because the sender’s email address is not forged, messages using this spoofing technique are often more difficult to block than those using domain name spoofing, where the addition of three DNS records (DKIM, SPF and DMARC) have been shown to be more effective at blocking spoofed emails. 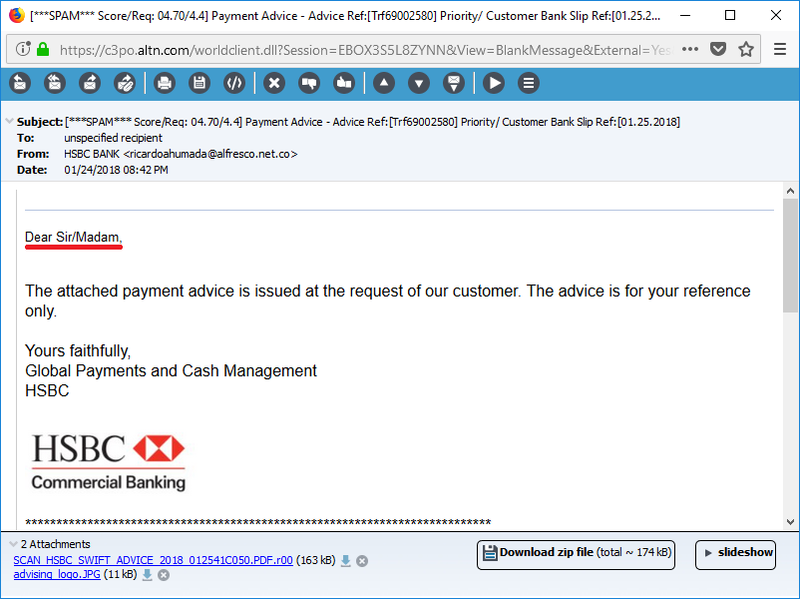 Here is an example showing a spoofed display name of HSBC Bank. To help users identify suspect emails, MDaemon Webmail has a handy security feature that displays the actual sender address as well as the display name. Lookalike Domain Spoofing – Lookalike domain name spoofing involves registering fake domains that contain characters that look similar to others and sending phishing emails from them in an attempt to trick the recipient into thinking the message is from a legitimate domain. 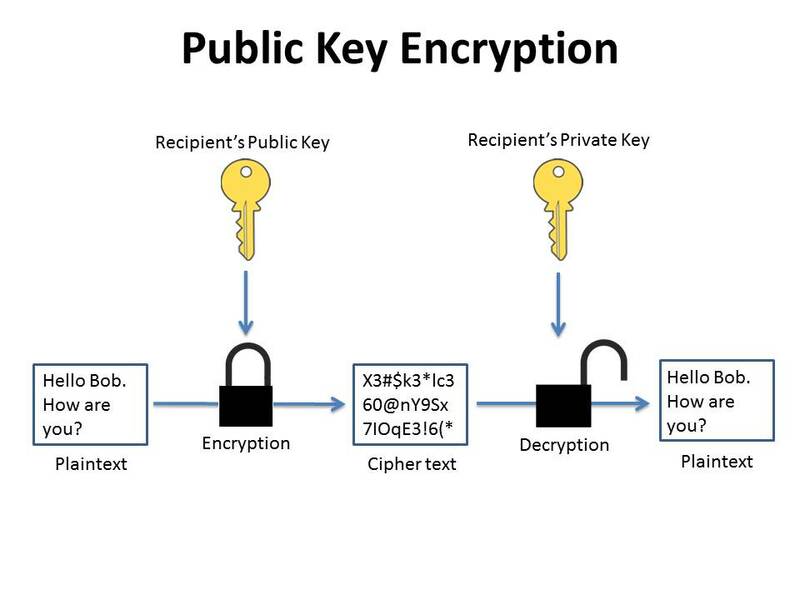 An example would be using an upper-case I in place of a lower-case L.
Compromised Email Account – Another common tactic is the use of legitimate email accounts that have been compromised through malware or social engineering to steal data or funds. Register domain names similar to yours to protect against lookalike domain spoofing. Be careful what you post on social media, especially job titles and responsibilities, corporate structure information, and out-of-office details. Sender Policy Framework (SPF), DomainKeys Identified Mail (DKIM) and Domain-based Message Authentication, Reporting & Conformance (DMARC) are anti-spoofing and email authentication techniques that use DNS records to validate the sender of an email. Make sure your domain has valid SPF, DKIM and DMARC records, and make sure your mail server/provider is analyzing all inbound email traffic using these tools. For more information, refer to this blog post. 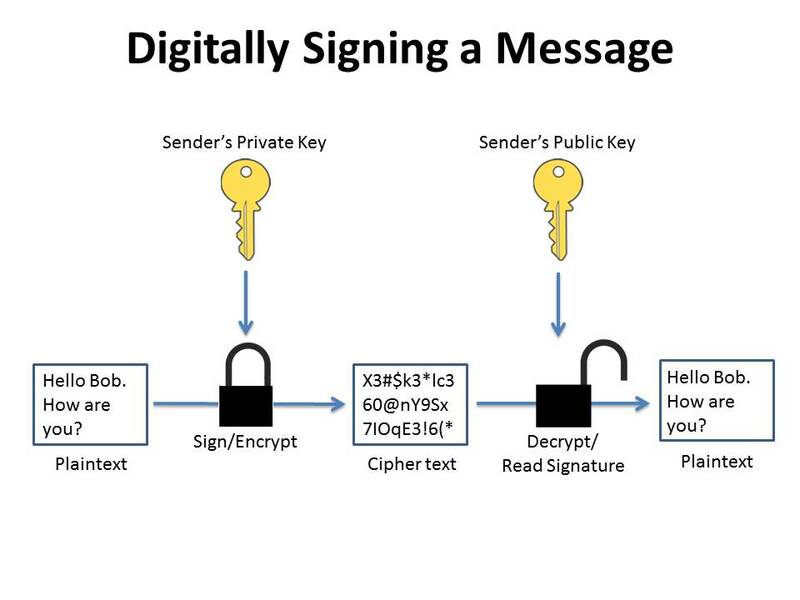 With two-factor authentication, users must provide two forms of authentication – a password and another form of verification such as a unique verification code or a fingerprint. Two-factor authentication is discussed further in this blog post. Must meet a minimum length requirement. Must contain both letters and numbers. Must contain both upper and lower case letters. May not contain the account mailbox or full name data. Never use commonly guessed passwords such as Password1 or Letmein. 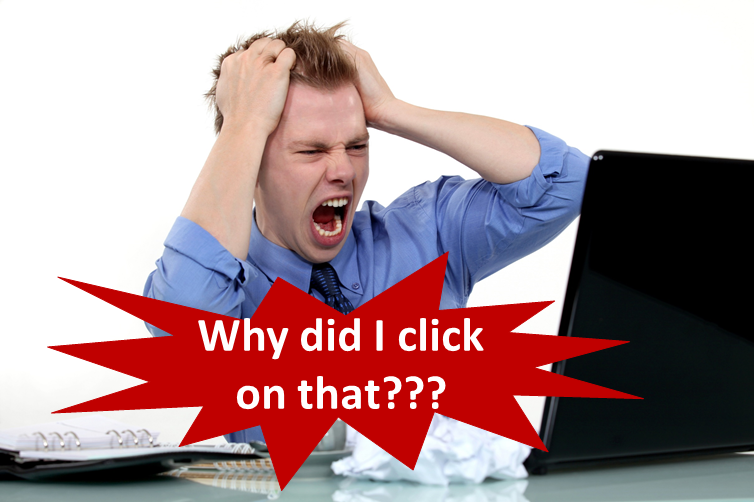 Never open emails, click on links, or download files from unknown senders. 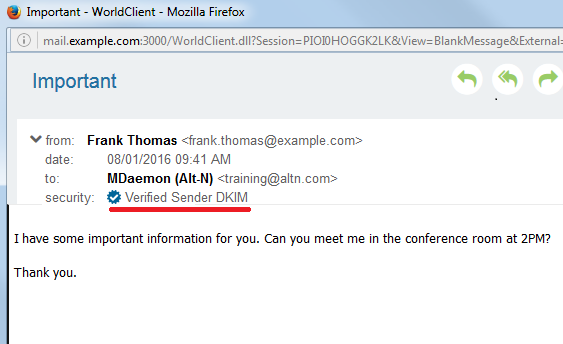 To help users verify the identity of a message sender, MDaemon Webmail displays the full email header in addition to the display name. You may recall from my previous post that cybercriminals have been known to target all parties in a real estate transaction. If you receive a request to change the payment type or the original recipient’s financial information, be sure to verify the information through already-established channels of communication. Before responding to wire transfer requests, verify the identity of approved vendors and the authenticity of their invoices. Confirm in person or by phone using previously known numbers. Don’t trust the phone number on the invoice. User education must be reinforced on a regular basis for stronger awareness. 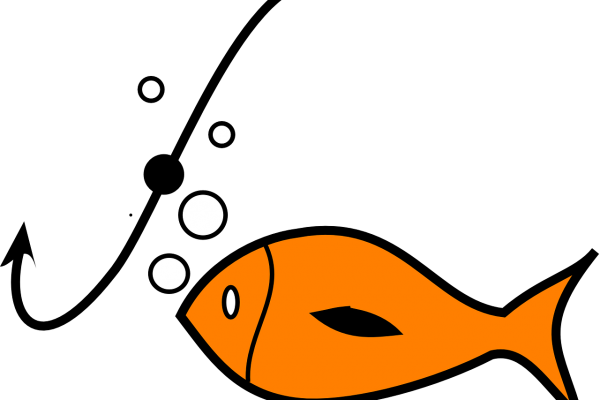 Every employee who uses email should know how to recognize a spoofed email or a phishing attempt. Make sure your antivirus software is up-to-date and run it regularly. While traditional security measures such as network defenses and email gateways can be effective at blocking most varieties of spam, the bottom line is that user awareness and education are critical to avoid falling victim to BEC attacks. 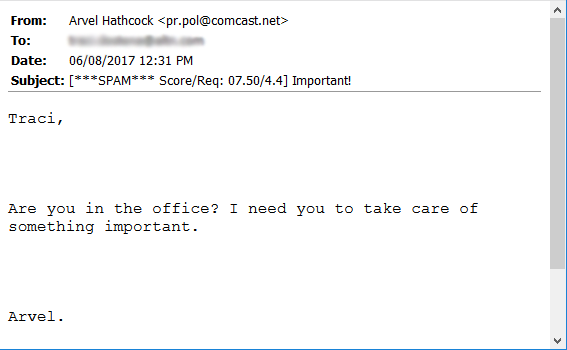 This week, we begin a three-part series on the threats posed by Business Email Compromise (BEC) attacks. In Part 1, we’ll explain what BEC is and discuss various types of BEC scams. In Part 2, we’ll explain how cybercriminals launch a BEC attack, and in Part 3, we’ll discuss best practices for avoiding these types of threats. Email is the preferred communication method for businesses around the world. It’s also the preferred attack vector for cybercriminals due to its ease of use and low cost, and since the beginning days of email, spam techniques have continued to evolve into a variety of sophisticated threats. One particularly menacing threat that is continuing to grow in popularity is Business Email Compromise (BEC). 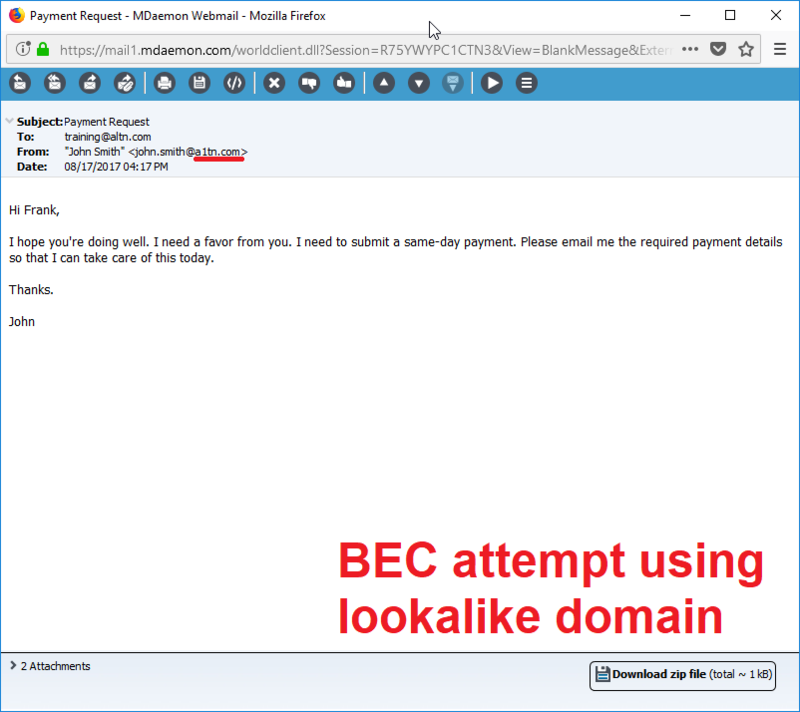 BEC attacks (also known as whaling, spear-phishing or CEO fraud) use various deception tactics to impersonate a trusted contact. They employ a combination of research and social engineering techniques to impersonate business executives, real-estate firms, title companies, law firms, and even the FBI in an attempt to elicit transfers of large sums of money or the exchange of personally identifiable information (PII), which can be used in future BEC attacks and other types of cybercrime. Victims of BEC attacks are often tricked into believing they are carrying out a routine transaction, such as filling an order with a supplier, transferring funds for an executive, or sending sensitive data to an HR representative. With the exception of those with spoofed sender addresses, many BEC attacks are sent from valid email addresses using credentials obtained through phishing, brute force attacks, or data obtained in a database breach like the one that hit Yahoo in 2013. BEC attacks often contain no malware, malicious links, or suspicious code. As a result, in many cases they are able to bypass traditional security measures, which makes them especially dangerous. Real Estate Transactions: During a real estate transaction, criminals may impersonate sellers, realtors, title companies, or law firms to trick the home buyer into transferring funds into a fraudulent account. Data and W-2 Theft: Criminals use a spoofed or compromised executive email account to send fraudulent requests for W-2 information or other personally identifiable information to HR staff or others within the business who maintain confidential employee records. 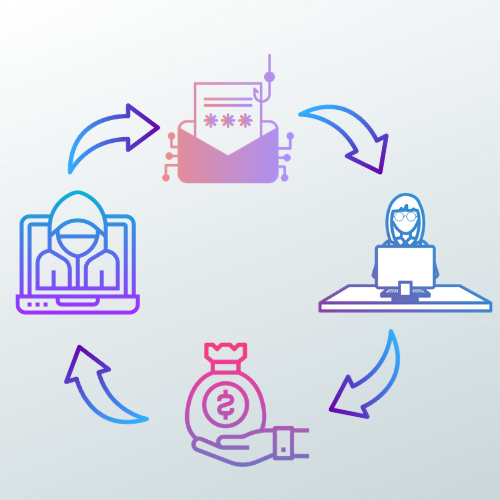 Supply Chain: Criminals send fraudulent wire transfer requests to redirect funds during a pending business deal, transaction, or invoice payment to an account controlled by organized crime groups. 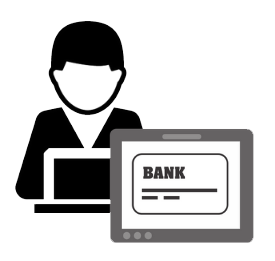 Law Firms: Criminals discover information about pending litigation or trusts and impersonate a law firm’s client to change the recipient bank information to a fraudulent account. The statistics are staggering. In July, 2018, the FBI released a public service announcement indicating that victims lost over $12.5 billion to BEC attacks between October 2013 and May 2018. In the United States, BEC attacks claimed over 41,000 victims during this five year period at a total loss of over $2.9 billion. In 2017 alone, the Internet Crime Complaint Center (IC3) received over 15,000 reports of BEC attacks with estimated losses of over $675 million. Based on victim complaint data, BEC scams targeting the real estate industry are on the rise. From 2015 to 2017, there was over an 1100% rise in the number of victims of real estate BEC scams and an almost 2200% rise in financial losses. May 2018 had the highest number of real estate victims since 2015, and September 2017 reported the highest victim loss. In 2013, Google and Facebook lost over $100 million in a scheme that impersonated a large Asian manufacturer. In August, 2017, MacEwan University lost almost $12 million to a spear-phishing campaign that impersonated a construction and contracting company. In June, 2017, a New York judge lost over $1M in Real Estate Scam that began as an email claiming to come from her real-estate lawyer. And this week a report surfaced about a Dutch cinema chain losing over $21.5 million to a “strictly confidential” funds transfer request sent to the company’s CFO. Despite efforts to raise awareness of these scams, a recent Gartner Research report indicated that BEC attacks will continue to be persistent and evasive, leading to large financial fraud losses for businesses and data breaches for healthcare and government organizations. 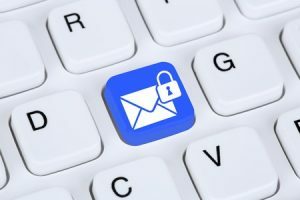 Why are Business Email Compromise threats so dangerous? 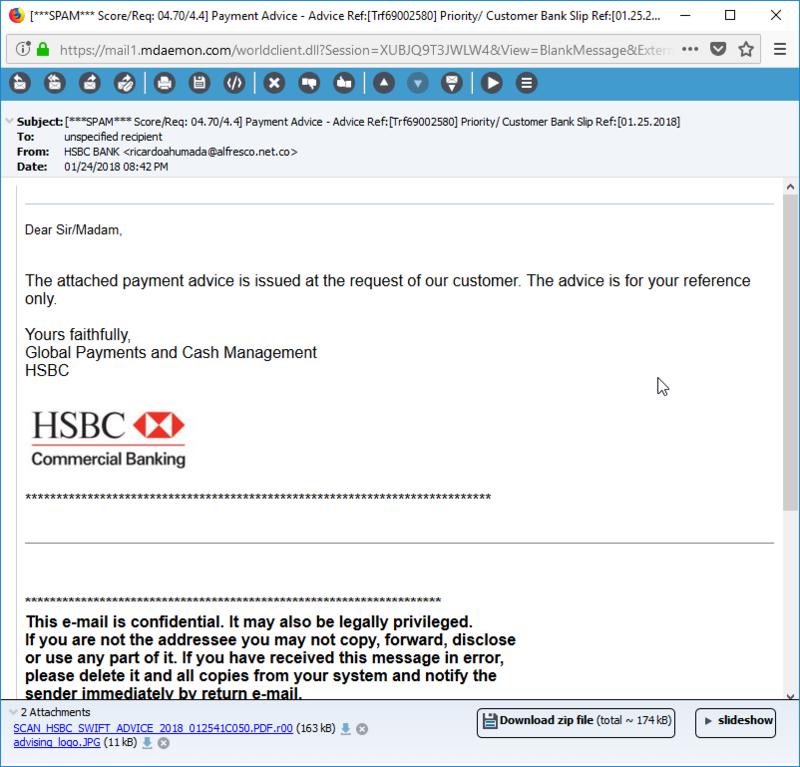 Business Email Compromise attacks are designed to bypass standard security mechanisms such as spam filters and anti-virus software, and are dangerous for a variety of reasons. They contain no malware. BEC attacks normally don’t contain malware. Instead, they use crafty social engineering to trick users into thinking they are legitimate. They are able to bypass many spam filters. 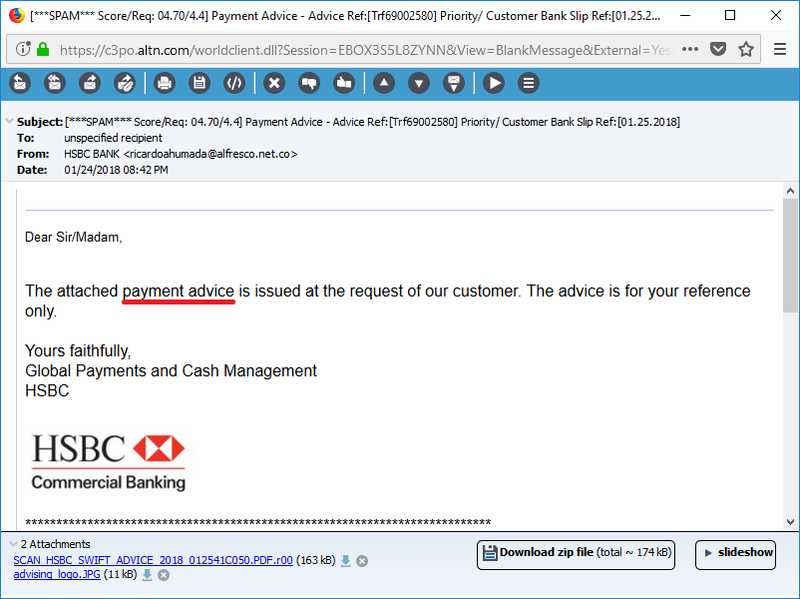 BEC scams are often well-crafted with no spelling or grammatical errors. 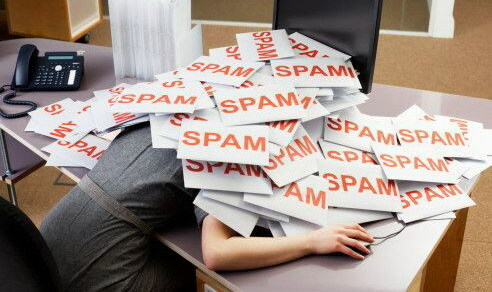 As a result, they are often able to bypass many spam filters. They are highly personalized. 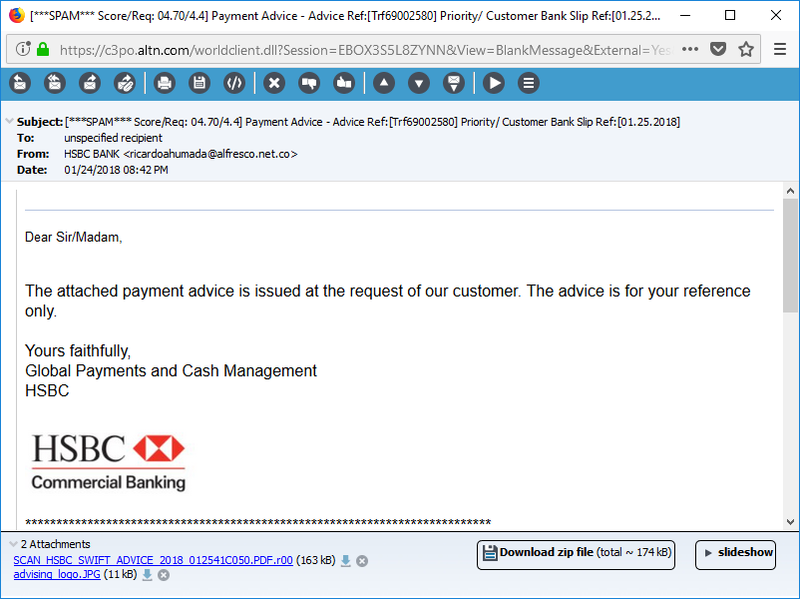 Scammers take their time researching the victim long before an attack is launched. They scour public websites, social media, and even the dark web to find specific information, including names and background information of company executives. Armed with this information and with knowledge of an executive’s writing style, their emails appear authentic. What is being done to stop BEC attacks? Recently, multiple countries launched a coordinated effort to dismantle international BEC schemes. This effort, known as Operation WireWire and involving the Department of Homeland Security, the Department of the Treasury, and the U.S. Postal Service, resulted in 74 arrests across multiple countries. Unfortunately, these attacks will continue as long as human nature can be exploited for personal gain. 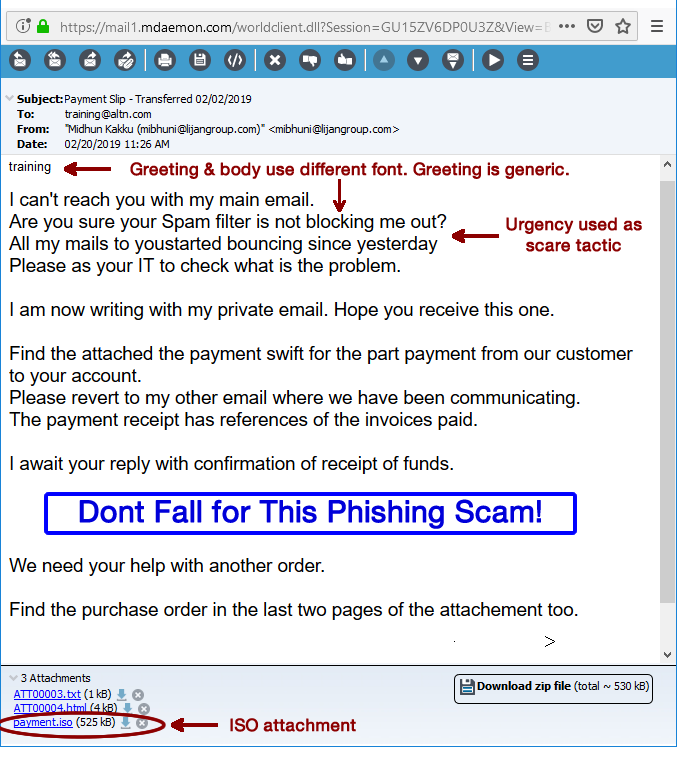 In fact, a recent report by Get Safe Online indicated that over a third (37%) of employees don’t know what to look for to identify common email scams. The report also stated that one in 20 email fraud victims were so ashamed that they hid their mistakes from their colleagues. Businesses of all sizes must remain vigilant against these threats. As the old saying goes, knowledge is power, and knowing how BEC attacks are launched and how to identify and avoid them is key. We’ll discuss these topics in parts 2 and 3 of this series, so stay tuned!